Designed by Sue Tinker, Closets Works. As homes get smaller with baby boomers downsizing, homeowners are seeking to become more organized. Oftentimes that means incorporating Murphy Beds into multifunctional spaces. But the increase in the demand for Murphy Beds is not just because boomers want smaller houses; the number of individuals working from home increased over the past few years as well as the number of millennials that chose to return to the nest to ride out the challenging economic environment created by the Great Recession. 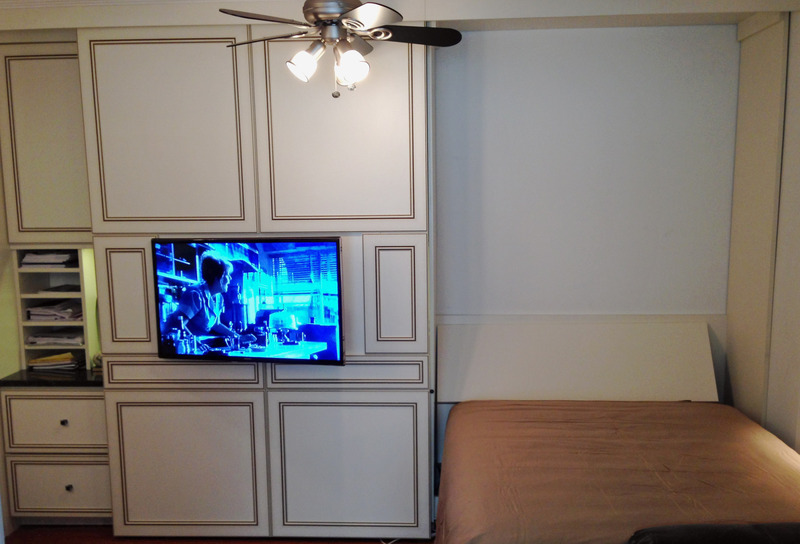 Here is a look a three creative Murphy Bed solutions. Designed by Robert Meyers, More Space Place DC. This project is a 12-foot wide by 10-foot deep multifunctional room used as a main living space. Meyers says the goal of the project was to keep the room as a sitting room allowing the client to watch TV and work at the home office at the same time. 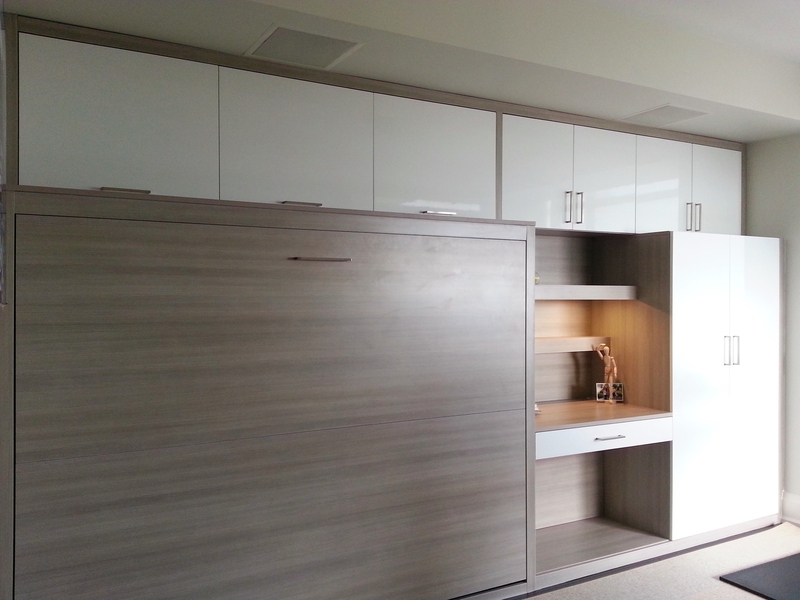 The challenge was to also include a full-size Murphy Bed for guests but not give up any functionality. 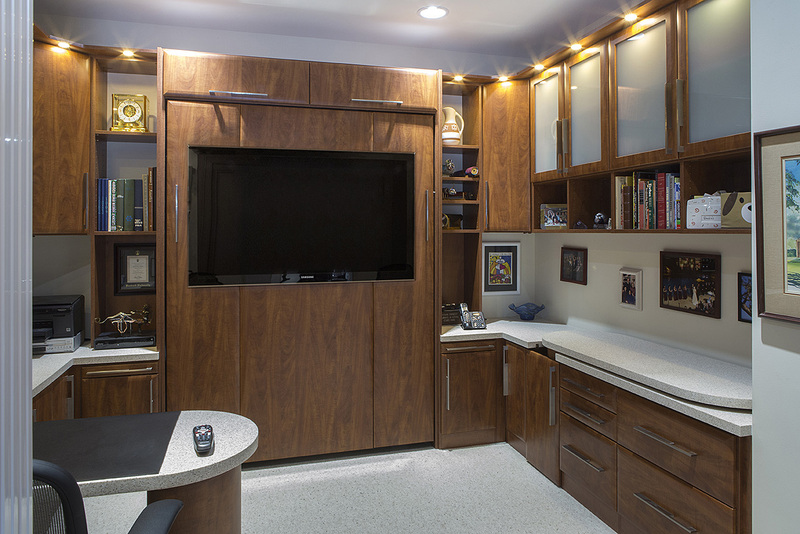 "We combined an 81-inch home office with lower and upper storage cabinetry, lighting and granite countertop," he adds. "TV components were designed into the home office area as well as a pullout shelf to use with the desk and the bed. 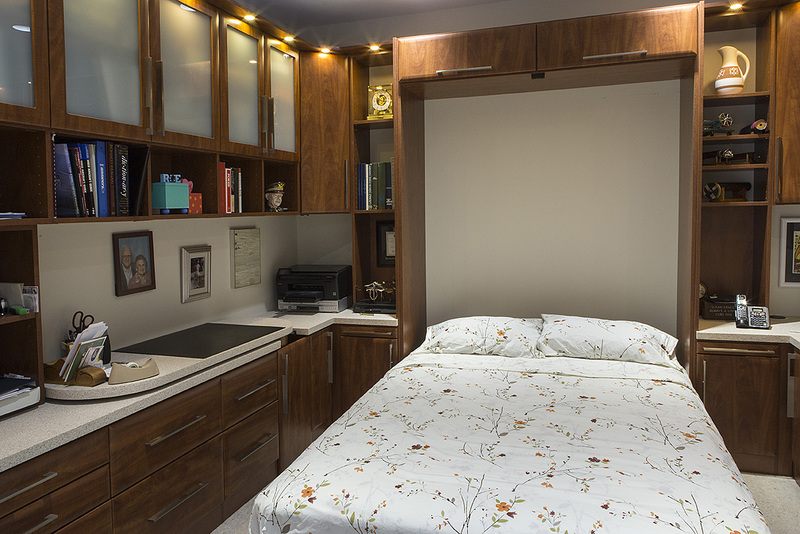 A very comfortable every night useable Murphy bed tops of the room for total functionality. Simply slide the large TV wall panel in front of the home office to access the bed. You can still view the TV when the bed is open. To round off the design, the client added two recliners to enjoy their media center." Designed by Sue Tinker, Closet Works. According to Tinker, this very creative client made the following requests: 1) Queen-size wall bed with TV attached to the outside of the bed. When the bed was being used the TV would remain attached and be basically under the bed inches from the floor. 2) Two pivoting desks that would slide into a compartment on the side of the room when the bed was needed. They would need to be designed so that any objects sitting on the desk would not have to be removed or put away when the desk was moved out of the way for the bed to fold down. 3) The compartment for the desk leg would have a counter top that could fold down when the leg was in and fold up to be flush with the rest of the counter when desk was out. 4) Maximum storage for files and office items as well as space for linens for the bed. 5) Locked storage for firearms. Her answer? No problem! 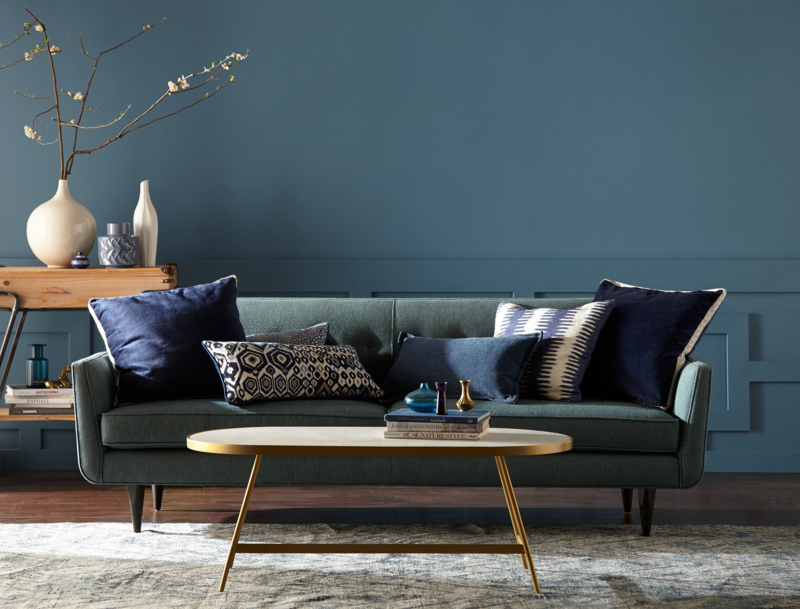 Designed by Dorothy Leung, SpaceSolutions.ca. The goal with this project was to create a multi-purpose space, says Leung. "The client’s niece was staying with them to attend school, so a bed was needed, and at the same time, the husband uses this as his workout room, so to facilitate that, a Murphy Bed made the most sense so that there would be room to use the treadmill, etc."